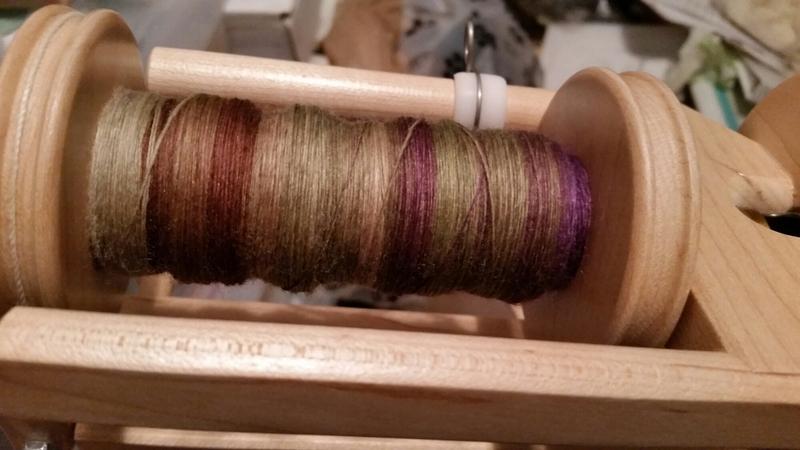 In my last post, I talked about starting the Sweet Georgia Yarns “Frozen Grapes”, and spinning it thin to make 3-ply sock yarn. I’m still working on that! Spinning that thin is just slow. I’m 2/3 of the way done with it, i.e. 2 bobbins are finished. I’ll start the 3rd one tomorrow. The holidays are upon us, so it seems like I have even less time than usual to get more and more done. I’ll be very happy to retire from my job in March (yes, the next one!) and reclaim my life. This entry was posted in Art, Fiber and tagged Spinning, Sweet Georgia Yarn. Bookmark the permalink.